(L-R) Mrs. Josephine Manyuru, Mrs. Faith Gitonga, Mrs. Zuhura Ogada-Odhiambo, Dr. Patricia Murugami, Mrs. Mumbi Gichuhi, Mrs. Esther Waititu and Professor Anne Muigai. Saturday 6th October 2018 brought together a gathering of over 150 women for the Your Next Best Self Conference at Nairobi’s Villa Rosa Kempinski Hotel. The event was hosted by Dr. Patricia Murugami, the founder and CEO of Breakthrough Consulting Solutions. This event was aimed at breaking the internal barriers that prevent a woman from becoming her next best self. It is on this note thus that the forum began. Dr. Murugami gave an insightful session on redefining failure and how redefining what constitutes setbacks can put women back on the path of success. This is what set the tone of the conference. The forum convened two keynote speakers, Professor Anne Muigai, professor of genetics at Jomo Kenyatta University of Agriculture & Technology and Josephine Manyuru, COO Manyuru Enterprises and four panelists, of which our managing director Mumbi Gichuhi was a part. The other panelists were Zuhura Ogada-Ogada, CEO New Revenue Solutions Africa; Faith Nkatha Gitonga, Digitial Transformation Lead, Public Sector, Oracle Kenya and Esther Waititu, Executive, Corporate & Investment Bank, East Africa, Stanbic Bank. 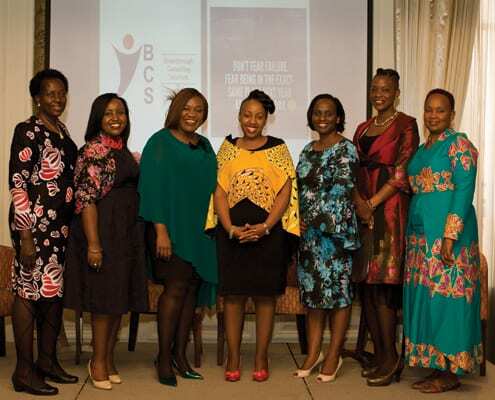 The women spoke candidly about their personal and professional experiences in these areas, including personal and professional challenges that they had encountered, and surmounted on their respective journeys. In keeping with #pressforprogress, these initiatives remain crucial, now more than ever, in achieving not only gender parity in the marketplace but also elevating women to take their rightful seat in the marketplace. The crucial role of the empowered women plays towards the journey of achieving sustainable development goals cannot be overstated and forums such as these set the tone for what women should aspire to.